My 4 year-old son collects leaves in his basket. We skip from tree to tree, each presenting a unique version of gold, red, orange, and yellow. We excitedly talk about the colors. He alternates between picking a favorite and carefully inspecting it to scooping up armfuls without a care in the world. At home, I've been saving packing material from a set of dishes. I like how the thin cardboard found between each plate is already pre-cut into circles. 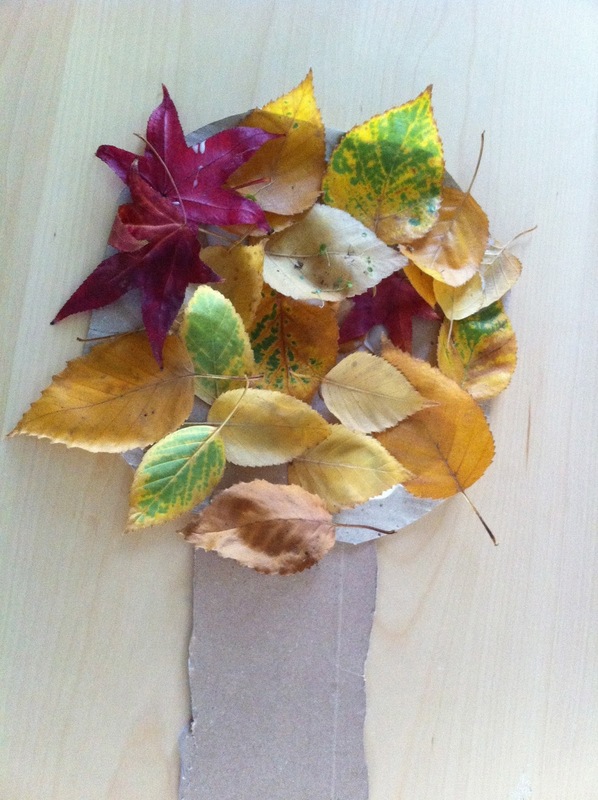 I offer the material to my son and ask him what he'd like to make with it plus the leaves. He easily imagines making his own tree. 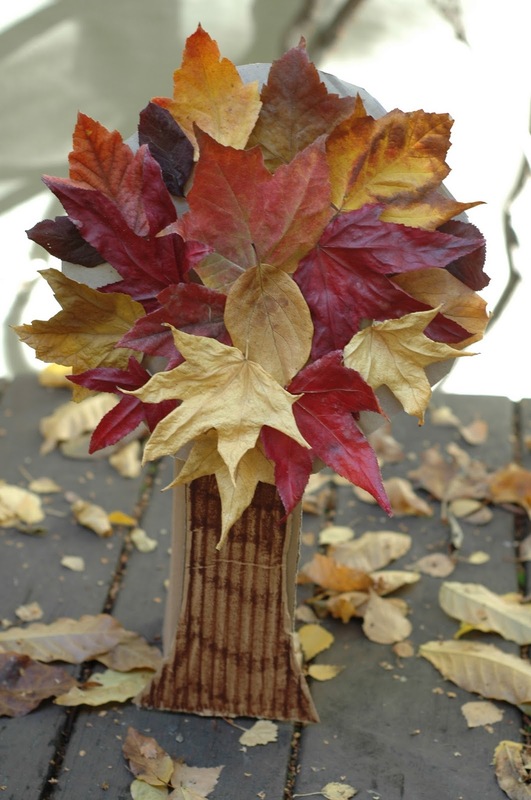 He makes this one for his grandmother's birthday by cutting out a trunk and gluing on the leaves - all easy for him to do himself. This is a good opportunity to talk about how the green color of leaves comes from chlorophyll, a pigment that helps the plants make their own food. When the weather gets colder, the leaves dry up, the chlorophyll goes away, revealing the bold browns, reds, and yellows. The leaves glue best if they haven't yet fully dried out. Otherwise they're brittle and crack and crumble. If you wish to dry the leaves first, just lay them flat so they can glue or tape flat. I added a stand to my tree using more cardboard. Consider making Thanksgiving placemats using leaves and contact paper. We're doing this today!